NOVEMBER/DECEMBER 2017 | www.broadbandcommunities.com | BROADBAND COMMUNITIES | 93 price transparency tools to assess how much bandwidth his district is getting for its budget in comparison with nearby districts. He discovered that although Andover's negotiated contract price was within the normal range, the district lagged behind in its bandwidth per student. In his E-Rate bid for 2017, he requested double the bandwidth to ensure that his district received the most value possible to meet current and future digital learning needs. Waiting for the contract expiration date isn't always necessary. Marwell says, "We've seen lots of examples where, even in mid-contract, the school district calls up the provider and says, 'What the heck?' It works because of the economics of broadband – it's free for service providers to give them more broadband. e service provider wants to retain the revenue, and the school districts don't mind paying what they're paying; they just want more bandwidth for it." INCREASING COMPETITION Broadband prices can also be reduced by increasing competition. Not long ago, many schools had difficulty getting any bids on E-Rate contracts, let alone competitive bids. In most cases, the only potential service provider was the local incumbent telco. e situation has improved in recent years. Several national fiber operators, such as Zayo and Level 3, have entered the E-Rate market on a broad scale, Marwell notes, as have regional players in some parts of the United States. Some schools are connecting to statewide research and education networks. 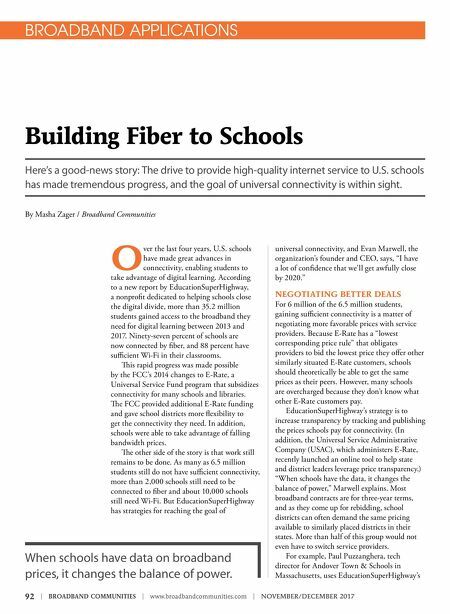 In 2014, the FCC began allowing schools to self-provision fiber – that is, build and operate their own connections – if that is the most cost- effective solution. Not many schools have tried to self-provision, and the FCC is often reluctant to approve their requests, but it has been done in a few cases, and the threat of self- provisioning puts some competitive pressure on prices. EducationSuperHighway lists all the providers doing E-Rate business in each state on its website so schools 2013 2015 2016 2017 School districts meeting 100 kbps per student goal 30% 77% 88% 94% Ninety-four percent of school districts are now ready for digital learning. 71% 88% 95% 2013 2015 2016 2017 97% Ninety-seven percent of schools have the fiber optic connections they require to meet current and future connectivity needs. 25% 64% 83% 88% 2013 2015 2016 2017 Eighty-eight percent of schools report having sufficient Wi-Fi in their classrooms.